Schipperkes make delightful family pets as they are joyful, enthusiastic, alert, active, and fearlessly devoted to their family. They are the proverbial big dog in a little dog’s body. They are selective in offering their friendship, generally giving their loyalty to their family, with whom they create strong bonds. They are famous for being devoted to children and are protective and fearless, sounding the alarm with strangers. 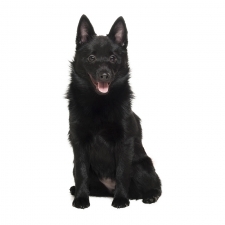 Schipperkes are very active little dogs and do best with a family who is the same. They make excellent hiking, camping, and traveling companions, as they love to be on the go. When it comes to training, however, they can be a little stubborn. Schipperkes are known for their cleverness, versatility, and devotion, thus making them an ideal family dog. Schipperkes generally weigh between 12 to 18 pounds and stand approximately 10 to 13 inches tall. They are a small dog with a stocky build. Their coats are thick, rough, and come only in black.